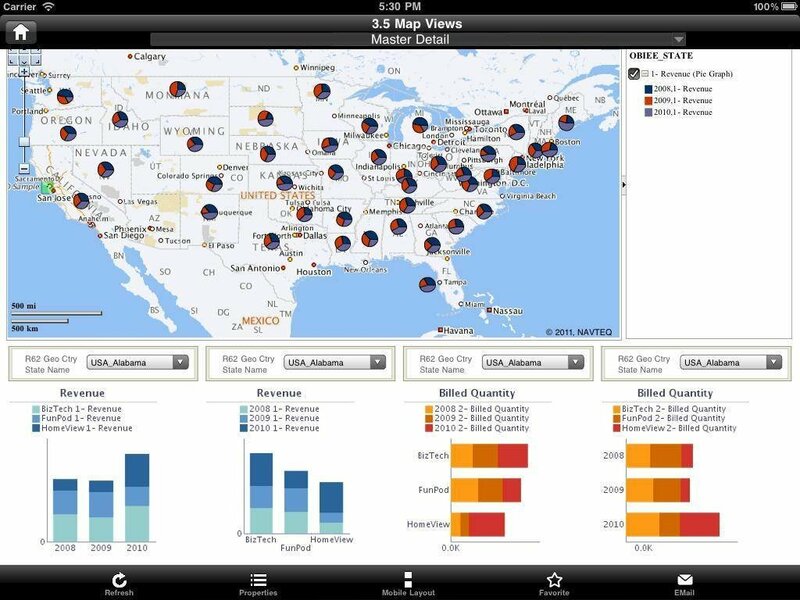 Oracle Business Intelligence 11.1.1.5 adds prebuilt integration with SAP Business Warehouse and Microsoft SQL Server Analysis Services, as well as support for the iPhone and iPad. Oracle’s latest business intelligence (BI) software upgrade adds prebuilt integration with Oracle’s own TimesTen in-memory database, its OLAP platform and competing products from Microsoft and SAP. The new features in Oracle Business Intelligence 11.1.1.5 allow companies to reduce the amount of customization they have to do in order to draw in data from non-Oracle sources, according to Dan Vesset, vice president of business analytics at IT research firm IDC. That said, Vesset doesn’t expect shops to rip and replace what they already have to adopt all the new features of the new release. It’s more likely that they’ll slowly adopt the standardization features over a long period of time. Aside from TimesTen and Oracle OLAP, the new release adds support for Microsoft SQL Server Analysis Services and SAP Business Information Warehouse. Vesset added that Oracle incorporating support for competitor products allows it to get inside those IT shops and possibly get them to migrate over to more Oracle products. This is not unusual among vendors. The new version also provides integration with Google Maps, allowing users to build mashups that can illustrate certain data with maps. For example, a supermarket chain might want to see a map of the United States with all of the company’s stores located, and with information such as revenue per store. Vesset said it gives companies another way to look at business data. Highly touted in the new release is the product’s support for Apple’s iPhone and iPad products. But according to Vesset, most companies probably aren’t ready for that, at least not yet. A Dresner Advisory Services survey last year also found a lot of interest in mobile BI, but some trepidation as well. Vesset added that he expects there to eventually be support for Android as well, although considering the legal battle Oracle and Google are embroiled in, who knows how long that might take.